Hey there friends! 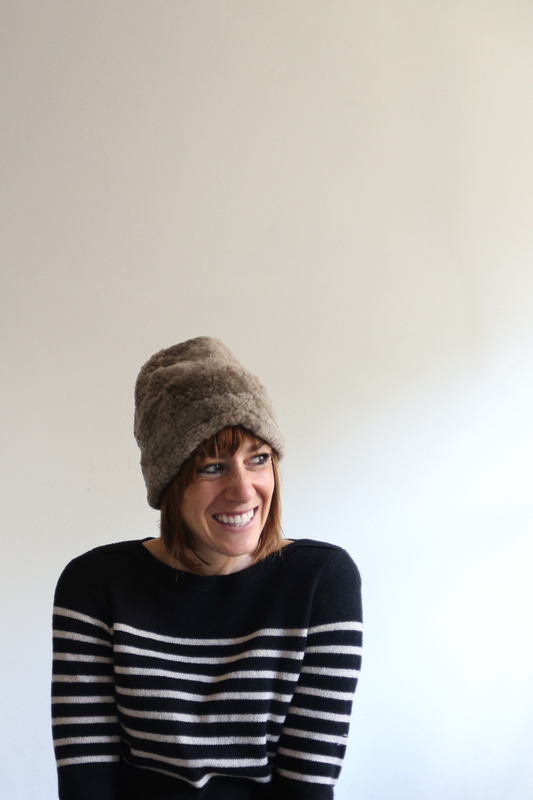 I’m excited to share today some ideas about capsule wardrobe or minimal wardrobe planning. I began using a capsule wardrobe in September two years ago, and it immediately resonated with me as a simple, intentional way to not only take the time and worry out of getting dressed every day, but also as a reinforcement of the ideas of minimalism and emotional abundance that I try to embrace in my life. I was also inspired by Caroline‘s fashion remix on Instagram, and decided to pull together a quick set of eleven easy fall outfits using only eleven pieces of clothing, including shoes (not including accessories.) Caroline used ten, but I mis-counted, so I had eleven and added an additional outfit to make up for it! 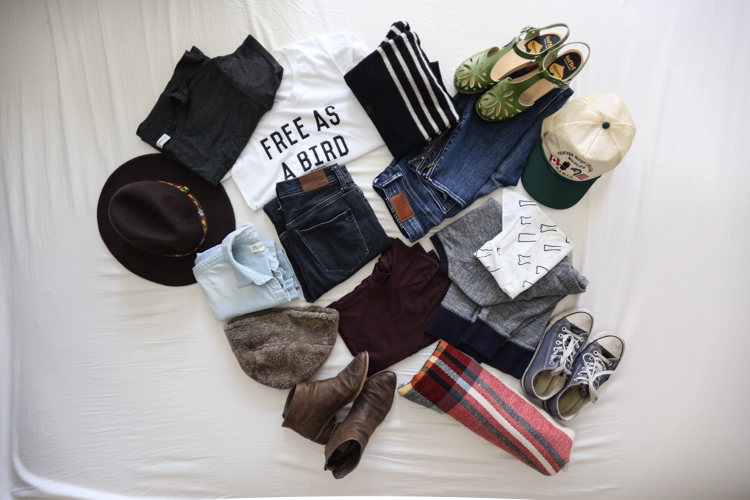 Let me begin by introducing the concept of a Capsule Wardrobe. This simply means that you create a specific set of items to wear, mixing and matching, for a given season. The program I used to begin recommended paring down to around forty pieces including shoes, tops, bottoms, skirts, and dresses. The capsule does not include pajamas, exercise clothes, accessories like scarves or hats, jackets, or special occasion clothing like a cocktail dress. The way I achieved my initial capsule wardrobe was by taking EVERY SINGLE THING out of my closet and going through them one by one making piles of definitely keep, definitely toss (or put away for a different season), and the maybes to review when I was counting. Living in Texas, I don’t have need of too many really cold weather clothes, and wear tee shirts beneath sweatshirts and such most of the year, so I found that my first fall capsule ended up taking me through all the way until the middle of the next summer when I needed to switch out a couple of the jeans and sweaters dresses and shorts. Other than that, I have operated using the same basic capsule for the last two years! In that time I have worn literal holes in the knees of two of my pairs of jeans, magically and naturally transforming them into distressed versions. 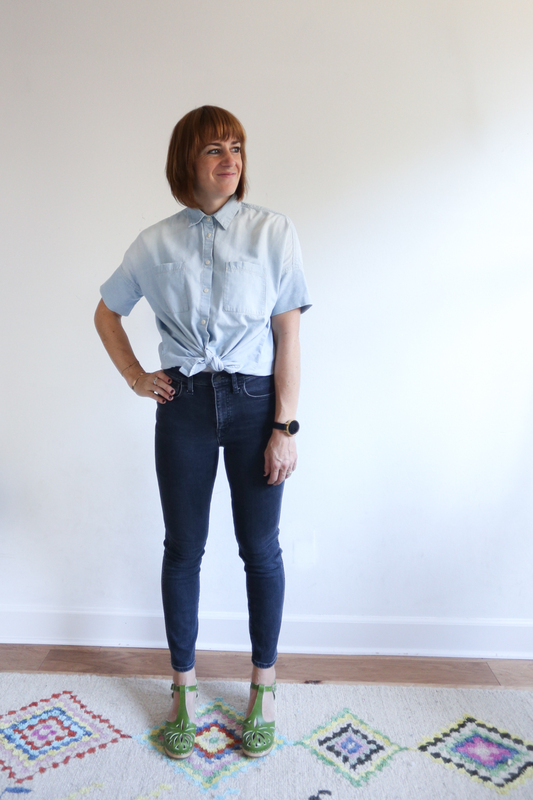 I love a lot of things about capsule wardrobing. The most obvious being how little effort, time, or energy is wasted getting dressed each day by eliminating the unnecessary decisions. Basically everything in my closet is something I love to wear, that fits well, and makes me feel like myself. I have learned, however, that I need to replace things as they wear out. That was something I didn’t expect! Before capsule wardrobing, I don’t know if I ever wore a single thing enough to actually wear it out, and it’s kind of a great feeling. 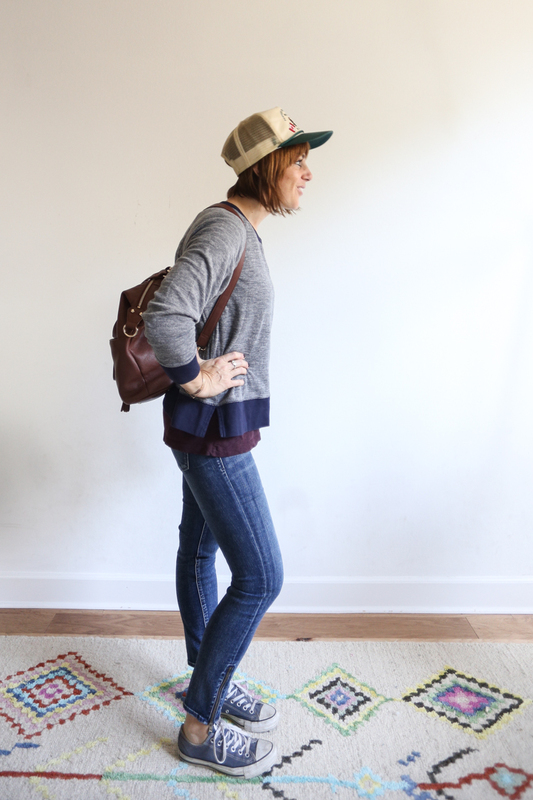 Yesterday, I pulled out a bunch of my newish favorite clothing items, and whipped together a fashion mix to share. Let me tell you what’s included. I’ll both describe each piece and share a link for the actual item, or something like it, because of course yours will look different from mine, depending on your style, and what you love. I’d describe my style as casual, earthy, and natural. Accessories for this remix include a cheeky neckerchief (designed by my talented friend Becky), wide brimmed hat, trucker cap (my grandpa’s), cozy fur beanie (mine was a souvenir from Peru), and plaid blanket scarf (I found this one in the Target Dollar Bins for $7! ), my daily diaper bag, basic daily bracelets from here and here, this smart watch, and this new smart ring, too. This outfit is a little more on the cool, hipster side of my comfort level, but feels practical and fun for an outdoor concert date night downtown or mini golfing with the kids. Or anytime. Let’s pause here to talk jeans for a bit. 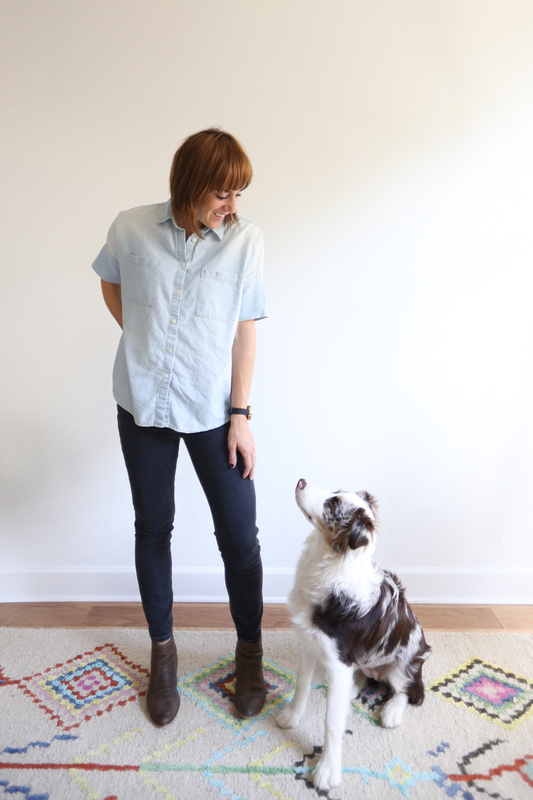 After Eliot was born five years ago, I went on an epic hunt for the most perfect jeans for my body type and style. In two days I went to more than ten stores and tried on likely around a hundred pairs of jeans. One of those pairs was these bad boys from Madewell, which at the time was new-to-me shop just opening up in Georgetown, DC. They fit high around my waist, so when I was sitting down and chasing my toddler, I didn’t show off my undies. They also had just enough give to fit tightly, but not like paint, and stretched comfortably over what I like to call my athletic thighs. We were on a student budget, but I bought two pairs (which felt like spending a fortune) and threw away all of my other pants that day. I wore one pair of black and one pair of blue for years, until adding another pair of black last winter. I still have both the original pairs, too. The black have massive natural holes in the knees, and I’ve mended a hole in the inseam, and the blue have a hole in one knee and the other is wearing through. I adore them both, still. 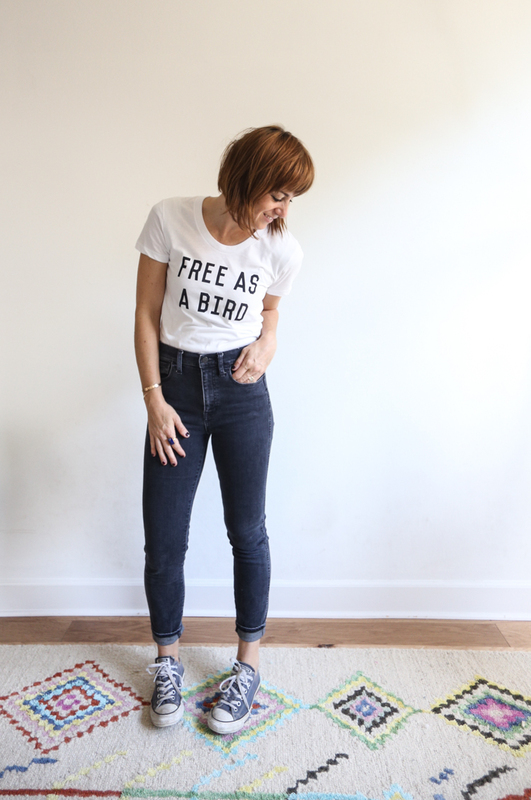 When ThredUp offered to send me some credit to try out their online consignment site, after humming and hawing, and initially feeling a little overwhelmed by the plethora of choices, I realized what I should do is go with what I knew and loved. 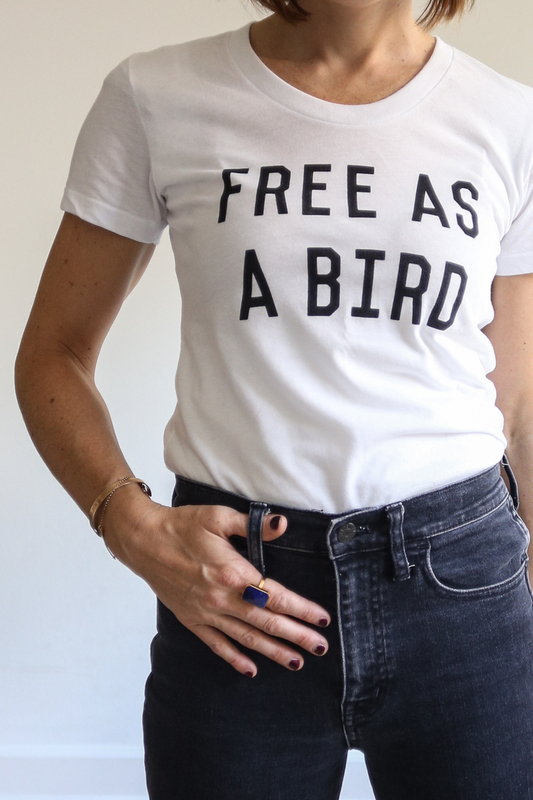 I searched, found, and ordered a pair of black and a pair of blue high Madewell high rise skinny jeans. The blue ended up having ankle zips, which entertained me immensely, and they were around $30 each! Like new jeans for $100 less than I spend in the store. There’s something to sticking to your style! 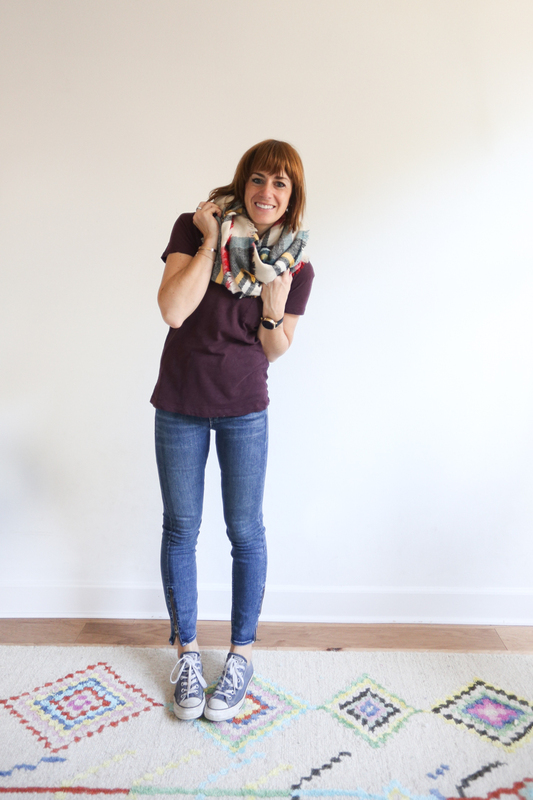 I chose the chambray, sweatshirt, and sweater from this post as well, all five items for $100! They are all things that fit naturally into my capsule, and I laughed that I was ordering more of the same, but that’s the beauty of a capsule wardrobe. Being comfortable enough with your personal style to stick to what you love. 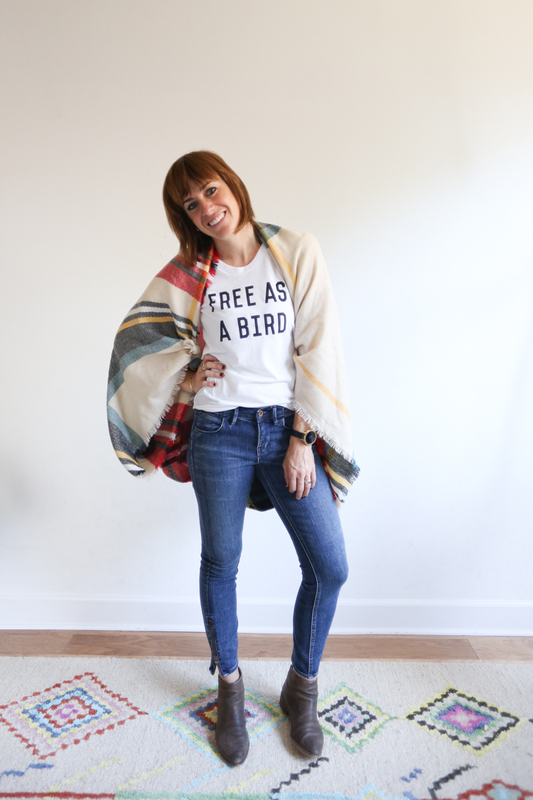 ThredUp has generally offered to share a 50% off discount code for any of my readers to treat themselves to some new jeans on their site! You’ll get half-off up to a $50 discount, using the code JEANS50. So, check it out and build some new favorites into your fall capsule with that discount. This outfit feels like a welcome to the fall weather! The sweater and beanie warm it up, and make it realistic for an outdoor family adventure. Truth: I bought this hat as a souvenir from a trip to Peru before I was married. It’s meant to be worn the other side out, with the alpaca skin showing, and the fur turned up as a brim. Turns out when you experiment with things you already have, you might surprise yourself in discovering new uses that you love! This is likely how you’ll find me on day eight of no hair washing, running errands with the kids after school. 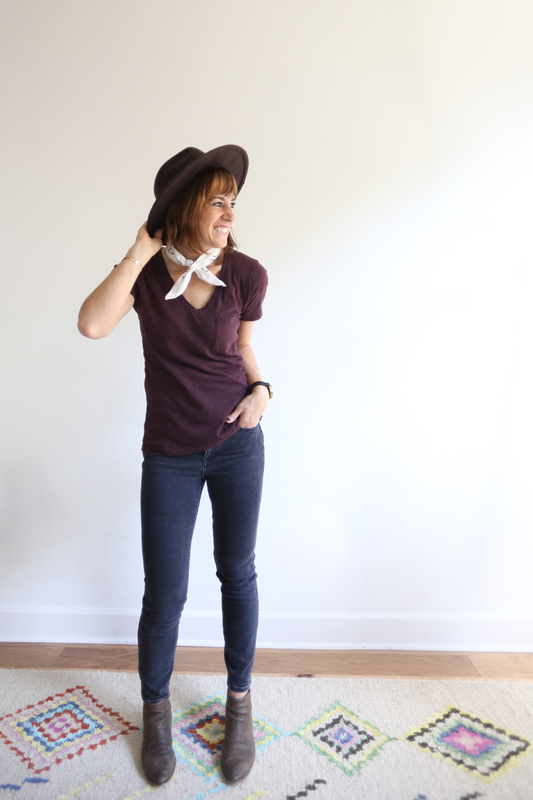 Adding a hat adds some intention, even though it may seem backyards, and I’ll say it again, well-fitting jeans can make an outfit. This outfit could be an ode to my sweet grandparents who are together in heaven, watching over me. My Papa was never without a trucker cap, and Mamo wore button-up shirts over tees on the regular. 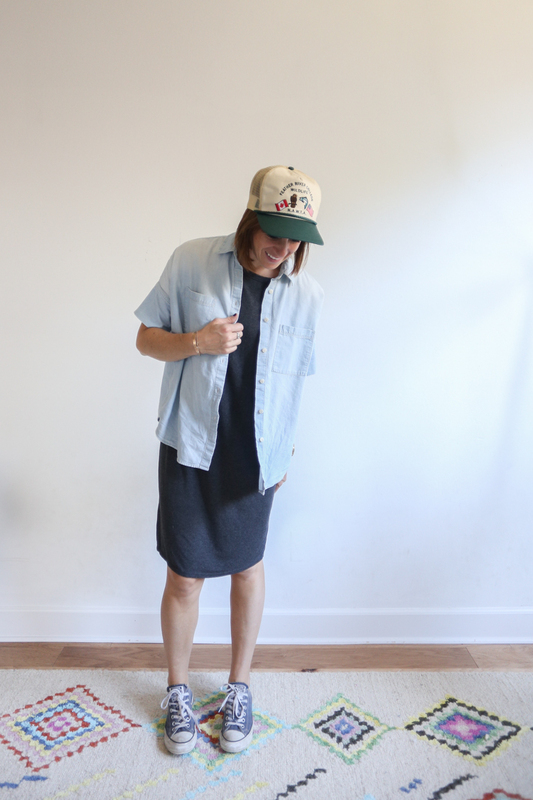 Paired with a tee shirt dress and chucks, the outfit feels layered and casual, changing the shape of the dress to a the boxier button-up. Another everyday sort of look, which is about what I have to offer! Eleven pieces of clothing, eleven outfits. 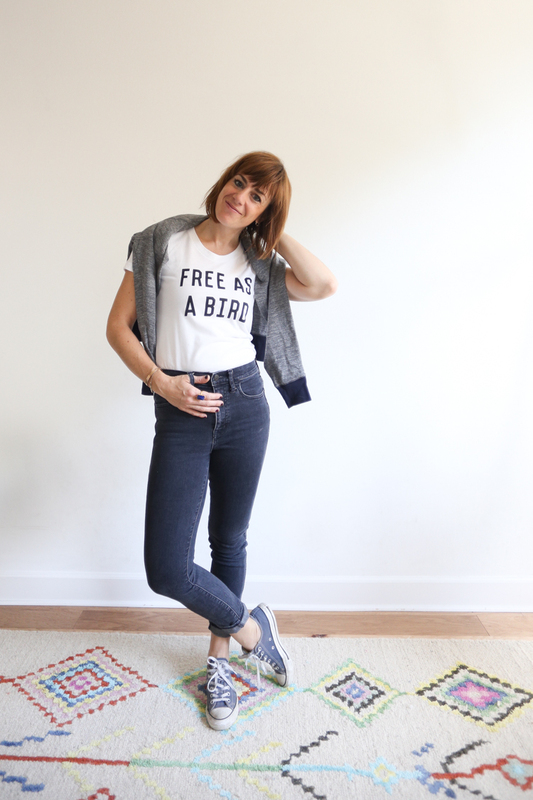 There’s a fall remix for you, and a look inside a mini version of a capsule wardrobe. Now, imagine you chose forty of your favorite items! After what we just did, forty seems like a ton of clothing to choose from! Over the years, my single season capsule has sort of merged into a year-round capsule, where I keep about 60 items out, but only actually wear 30-40 of them during a season. With my closet being large enough, I can simply hang the spring/summer and fall/winter tops separately, and choose that way. To finish off this post, I want to share some general thoughts on minimalism and contentment. It was a lesson in patience and financial management, but also a lesson about contentment, gratitude, and satiety. I had already spent the whole day shopping! I don’t remember a single thing that I bought that day, but I’m sure I really liked all of it! Yet, so quickly I became enticed to want more. 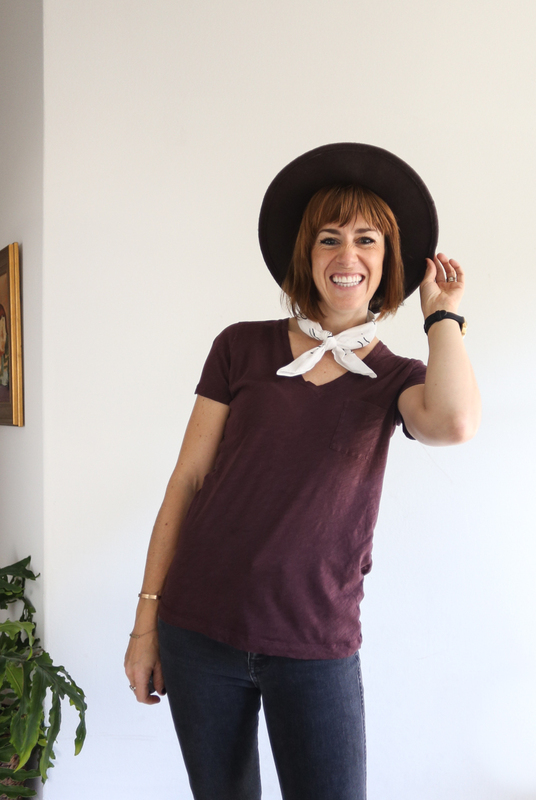 Maybe this seems like weird concept to share at the end of a post about fall fashion, but the idea and implementation of a capsule wardrobe has encouraged me to be so much more thoughtful about what I chose to add to my closet. I’m not a big shopper in general, partly because when I get into a store, I immediately create that new benchmark for myself of how I want and need so many of these wonderful, beautiful things. But when I am being intentional, rational, and thoughtful about what I have and what I need, my brain can override my nature and create a lovely system for conserving the time, money, energy, and emotion that can be lost in that downward spiral of always needing more. Finding happiness within the daily routine and rhythms of our lives brings a peace and contentment not found in the ever-moving rat race, and thoughtfully minimizing my belongings has helped me stay on that track. I’d love to hear your thoughts or answer questions that you may have! Find me on Instagram or leave comments here and let’s continue the conversation!